Engage in a day-trip to Meteora, a spectacular natural landmark that will properly introduce you to the sanctity and religiosity of this pivotal monastic community. Meteora is a natural landmark nowhere to be found around the world. The imposing vertical rocks standing as pillars reaching the sky, host on their plateaus ancient monasteries with a vast cultural significance not only for the region but for the whole of Christianity’s history as well. Therefore, while in Greece you should definitely invest a day in visiting this place of splendour. Hop on a train from Athens and enjoy the historical route full of spectacular images of natural beauty as you will pass through national parks, stone arched bridges. Let the landscapes follow one another and reach Meteora, spend your day there and return in Athens late that day. Immerse into the religiosity of the site through the vivid narration of your engaging, expert tour guide. Engage in a 3.5-hour tour at Meteora, visit all six monasteries of the monastic community and have the chance to enter 2 of them to experience the everyday life of the monks. Possibility to extend your stay in Meteora for another day and explore the area a bit more. We traveled to Kalambaka by morning train from Athens. The same day we had to come back. So we arrived aprox at 2 pm and had only 4 hours to see as much as possible. We were lucky as we were assigned an excellent guide. He tried to show us as much as possible. We have got a lot of interesting information during the tour in a comfortable mini-bus. Amazing experience! Start your day early (8.20 am) and head to the main Railway Station of Athens (Larissis station) to catch your train to Kalambaka, the main city close to the rocks of Meteora. Your journey will take approximately 5 hours as you are following the historical route of the railway through national parks, historical cities such as Thebes and the forests of the foothills of mountain Oeta, from where Herakles ascended to Olympus according to ancient Greek mythology. Continue your trip through the Plain of Thessaly, having as destination the city of Kalambaka. Enjoy as the different landscapes alternate in front of your eyes and without noticing find yourselves in the mountainous Kalambaka. As you are exiting the train station, a luxury vehicle is going to wait for you to pick you up. Your expert, fluent in English, tour guide will welcome you at the station and take you to an unforgettable experience. Ascend to the imposing rocks of Meteora and realise why these first monks of Christianity, hundreds of years ago, chose this location to create their monastic community and seek real communication with God. Visit all 6 ancient monasteries and nunneries of Meteora, and have the chance to enter two of them in order to taste the everyday life of the monks, admire their architecture and gaze at the priceless relics and treasures of the monasteries, a cultural heritage to all Christianity. 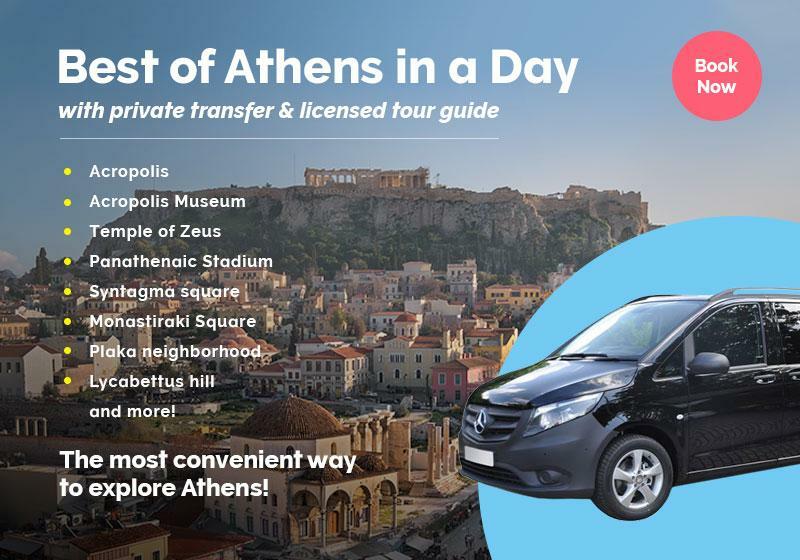 After your Meteora tour, your limo minibus will take you to the Kalambaka station for you to catch the train back to Athens. The train departs at 17.32 and arrives in Athens at 22.30. Round Trip Train ticket costs (1st class tickets also available on request with an additional cost). Pick up/drop off from/to Kalabaka train station. What is the language of this tour? This tour is offered in English. In case you want it delivered in a different language, please send us an email and we will reply to you shortly. Sure it is! Our company guarantees you a memorable experience for you and your family. All you have to do is grab your camera and start some memory-making. In order to make your trip even more enjoyable, please send us an email with every detail you want us to sort out for you! Is there a dress code for the monasteries? Keep in mind that you are going to visit some of the most sacred monastic centres of Greece with still active monks. Therefore, implying to the dictated etiquettes and expressing your utmost respect is definitely a prerequisite to avoid any mishaps. For any further questions please send us an email and we will reply to you shortly. In case there is something wrong with your trip, please call us on +30 694 2070899. The "Meteora day trip from Athens by train (daily)" is available as a private tour, in order to further customize your experience to fulfill your specific needs & expectations. Simply tell us your preferences in the booking form below.